We have lots of goats! These majestic white animals are always thought of as being up on the pinnacles of the highest mountain tops. Well do we have a surprise for you!! 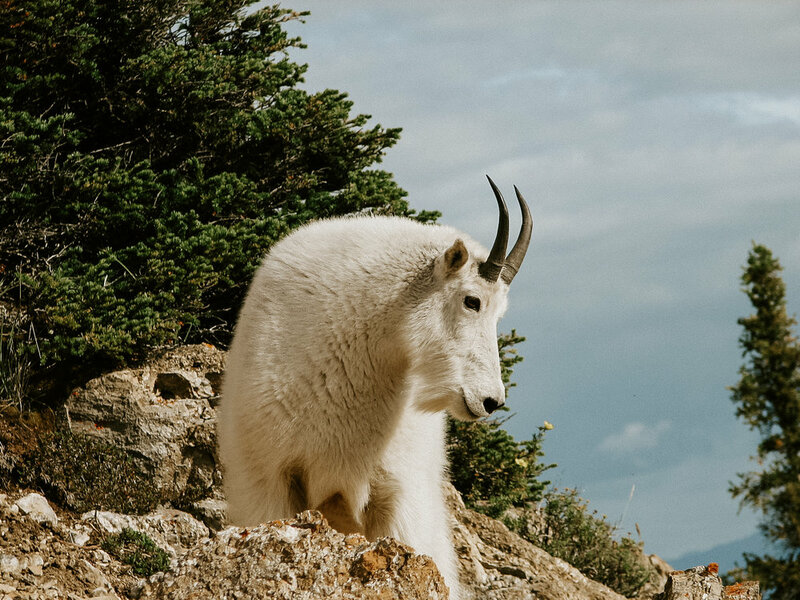 Scoop Lake Outfitters’ 2.5 million acres of exclusive guide area is home to one of the largest goat populations in British Columbia. Most of our hunts are by horse back, from well-equipped and warm, comfortable cabins. You will spend a large portion of your time riding and glassing, and trying to get above your goat. However, this is not to say you don’t need to be in shape. As always, there is some climbing involved, but no ropes or pinions. Our average client is about 55 years in age and we’ve had a 95 percent success rate. We have lots of goats. Mountain Goats are a very beautiful animal. Most of our clients mount them life size. One of the most important aspects of harvesting a goat is that it needs to have good hair. At Scoop Lake, we hunt from August 25th to October 15th due to the fact that in our geographic location, Northern BC, our goats have excellent hair during this time of the year. Our goats average 9-9 1/2 inches. You can combine a Mountain Goat hunt with Moose, Caribou, Elk, Black Bear and Wolf. Our most common combination hunt is Goat and Moose or Goat and Caribou. We hunt our Moose and Caribou in similar terrain around the 4500 to 5000′ elevation. At Scoop Lake, we prefer to harvest only Billy Goats even though the regulations say you can harvest Nannies or Billie’s. Due to our self imposed Billy Goat only harvest, we have one of the largest goat populations in northern British Columbia. It is not unusual to see as many as 30 goats in a single day. When inquiring, ask about our ‘two on one’ goat hunts. These are fun hunts and your opportunities for success are always very good. Remember, you don’t have to climb any 10,000-foot mountains to be successful when hunting with Scoop Lake. We have great success because we have great guides, lots of goats and good accessibility.